Death claimed another dear mother and grandmother when God called from this earth to his heavenly home Anna Louise Fette. She had been ailing for several years but always was able to visit with her children with the exception of the last few months, when her condition grew worse and her health was failing fast. She was bedfast for the last five weeks bearing her cross which was laid upon her patiently and was ready to answer her Master’s call and with folded hands ant [sic] a wispering [sic] prayer she fell asleep in the arms of her dear Savior, who will awake her, when He comes in all his glory on the last great day. Since the death of her husband, Mrs. Fette has made her home with her children and relatives with the exception of the last two years she made her home with her daughter, Mr. and Mrs. Louis Dyrssen of Lexington, where she had the best of care. She spent most of her life in Alma where she also counted many friends. She was a dear mother to her children, a kind neighbor and a true friend, loved by all who knew her. She died on Sunday morning, November 18, 1928, at an age of 60 years, 10 months and 8 days, at the home of Louis Dyrssen at Lexington, Mo. The funeral was held at Lexington Tuesday afternoon, November 20, from the home of Louis Dyrssen where a short service was conducted in the English language by her pastor Rev. Albert Jesse of the Grace Lutheran church at Lexington. The body was then taken to the Trinity Lutheran church at Alma where Rev. Albert Jesse spoke words of consolation. Hymns of faith and hope were sung by the congregation and a song was rendered by the Trinity Lutheran choir. After the body had been viewed by many that had come to pay their last tribute to the departed, it was taken to the Lutheran cemetery where Rev. Griesse delivered a consoling sermon and prayer. The body was placed in its last resting place under a lovely bed of flowers there to rest in peace until the glorious morn of resurrection. The pallbearers were Hy. Dankenbring, Fred Franz, J. G. Mueller, Hy. Fuchs, John Dierker, Hy. Schumacher. The mourners have our sympathy in their sad bereavement. Anna Louise Fette, nee Scholle, was born January 10, 1869, at Rising Sun, Indiana, where she received her education. She came to Alma at the age of 16 years. She was married on April 13, 1887, to Edward C. Fette, who preceded her in death 8 years ago on September 17, 1920. This union was blessed with 4 children, 3 sons and one daughter. Those who mourn the death are: Clarence H. Fette of Alma, Mo., Normal, Mrs. Louis C. Dyrssen of Lexington, Mo., and Irvin J. Fette of Sweet Springs, Mo. ; 11 grandchildren one son-in-law and 3 daughters-in-law, one sister, Mrs. Chas. Fischvogt of Rising Sun, Ind., one brother, Louis Scholle of Higginsville, Mo., and many other relatives and friends. 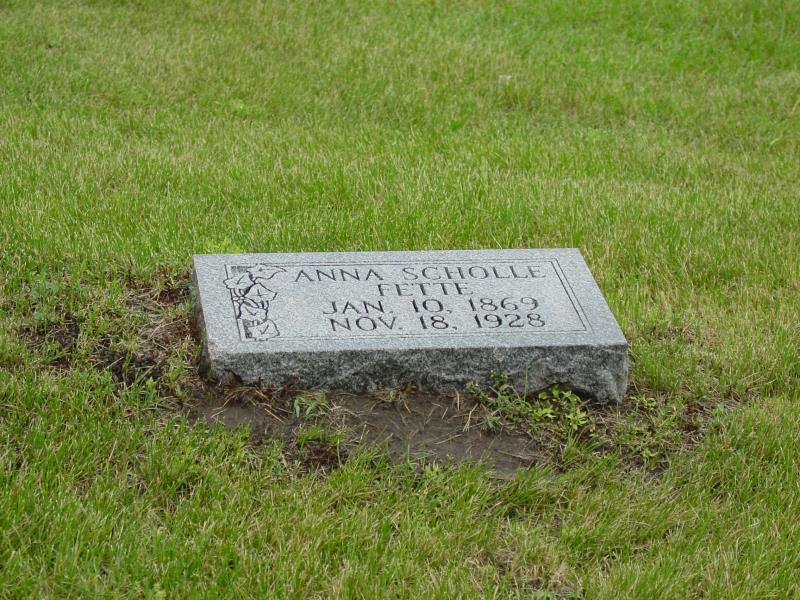 Anna Scholle Fette was my g-g-grandaunt.